Buy Bombshell cd key for PC in digital version at best price is already possible by Gocdkeys! You can preorder Bombshell for Steam in any of the online shops registered in our price comparison site. To activate the download from Steam, you must add the digital serial of Bombshell into your user account. 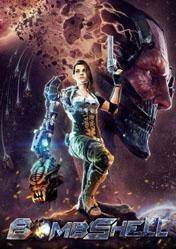 Bombshell is a game made by the creators of Rise of the Triad, an action role-playing game, in which travel through 4 planets in a galactic adventure powered by the Unreal Engine, in order to rescue the president some evil aliens who want to wreak havoc and destruction on our planet. For this mission, we have at our disposal an arsenal never seen before, which includes ancient weapons and the latest technology gear, with which we will end this threat. This game is an adventure mixed with the shooter genre, make it a very original and fresh title, that will not leave indifferent lovers of both genders. With a shooting system very accomplished and fun, Bombshell is presented as a new title and certainly create the foundations of a new mixed genre of RPG games. Remember that all stores appearing in gocdkeys have been tested by our team so they are 100% reliable, even so, we recommended you to carefully read the specifications in each store at the time of shipping, ways of activation (in case it is digital version) and methods of payment.